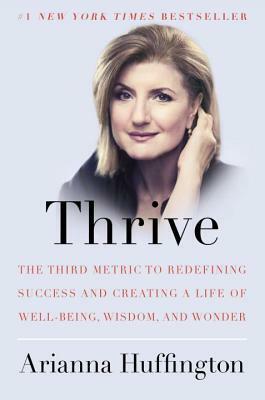 In Thrive, Arianna Huffington makes an impassioned and compelling case for the need to redefine what it means to be successful in today's world. Arianna Huffington's personal wake-up call came in the form of a broken cheekbone and a nasty gash over her eye -- the result of a fall brought on by exhaustion and lack of sleep. As the cofounder and editor-in-chief of the Huffing In Thrive, Arianna Huffington makes an impassioned and compelling case for the need to redefine what it means to be successful in today's world. Arianna Huffington's personal wake-up call came in the form of a broken cheekbone and a nasty gash over her eye -- the result of a fall brought on by exhaustion and lack of sleep. As the cofounder and editor-in-chief of the Huffington Post Media Group -- one of the fastest growing media companies in the world -- celebrated as one of the world's most influential women, and gracing the covers of magazines, she was, by any traditional measure, extraordinarily successful. Yet as she found herself going from brain MRI to CAT scan to echocardiogram, to find out if there was any underlying medical problem beyond exhaustion, she wondered is this really what success feels like? As more and more people are coming to realize, there is far more to living a truly successful life than just earning a bigger salary and capturing a corner office. Our relentless pursuit of the two traditional metrics of success -- money and power -- has led to an epidemic of burnout and stress-related illnesses, and an erosion in the quality of our relationships, family life, and, ironically, our careers. In being connected to the world 24/7, we're losing our connection to what truly matters. Our current definition of success is, as Thrive shows, literally killing us. We need a new way forward. In a commencement address Arianna gave at Smith College in the spring of 2013, she likened our drive for money and power to two legs of a three-legged stool. They may hold us up temporarily, but sooner or later we're going to topple over. We need a third leg -- a third metric for defining success -- to truly thrive. That third metric, she writes in Thrive, includes our well-being, our ability to draw on our intuition and inner wisdom, our sense of wonder, and our capacity for compassion and giving. As Arianna points out, our eulogies celebrate our lives very differently from the way society defines success. They don't commemorate our long hours in the office, our promotions, or our sterling PowerPoint presentations as we relentlessly raced to climb up the career ladder. They are not about our resumes -- they are about cherished memories, shared adventures, small kindnesses and acts of generosity, lifelong passions, and the things that made us laugh. In this deeply personal book, Arianna talks candidly about her own challenges with managing time and prioritizing the demands of a career and raising two daughters -- of juggling business deadlines and family crises, a harried dance that led to her collapse and to her "aha moment." Drawing on the latest groundbreaking research and scientific findings in the fields of psychology, sports, sleep, and physiology that show the profound and transformative effects of meditation, mindfulness, unplugging, and giving, Arianna shows us the way to a revolution in our culture, our thinking, our workplace, and our lives.